Is this paving the way for the next-generation Continental GT? Not long after the reveal of the opulent Galene Edition inspired by a luxury yacht, Bentley is showing off yet another special edition of the Continental GT to celebrate 14 years of the luxury grand tourer being on the market. Called the Timeless Series, the limited-run car will be available exclusively as a convertible just like the Galene Edition, but Bentley hasn’t said how many examples it will produce. Seven different themes will be available: Glacier, Camel, Light Ice, Cool, Dark Sapphire, Onyx, and Havana. A slew of exclusive "Timeless Series" badges and treadplates help distinguish the luxury convertible, while the upper and lower grilles are coated in shiny chrome. Elsewhere, a pair of puddle lights display the automaker’s logo. It’s inside the exquisite cabin where the changes get more striking, however. The choice of luxury upholstery options is as comprehensive as you would expect. In a first for the Continental GT, the dashboard is decorated with a Liquid Amber veneer featuring five layers of hand-painted lacquer. A two-tone steering wheel, rear view camera, and ventilated front seats with a massaging function also now come as standard. As for interior tech, the Continental GT Timeless Series is equipped with an eight-inch touch-based infotainment system that has a 30 GB hard drive with 15 GB of music storage, and built-in satellite navigation. Audio connoisseurs can also add a Naim sound system for an additional cost, which includes higher quality speakers and eight digital sound processing models for superior sound. Curiously, Bentley is tailoring the engine specifications for different markets. 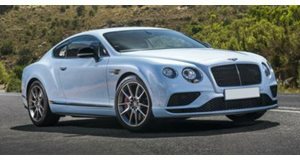 In the US, the Continental GT Timeless Series will be powered by a 6.0-liter twin-turbo W12, whereas Europeans will have to settle for a 4.0-liter twin-turbo V8. Both versions ride on 21-inch alloys with different designs for each market. Chances are the Timeless Edition is paving the way for the new generation Continental GT model, which is expected to debut at the Frankfurt Auto Show in September with a radical redesign.